OU Distance B.Ed Entrance Test Hall tickets, Exam Date 2019: OU B.Ed Distance Mode Entrance Test Hall tickets, Exam Date to be released soon on its official website for B.Ed (Distance Mode) Admissions 2018-2019. Directorate of Admissions, Osmania University, Hyderabad has issued Bachelor of Education(Distance Mode) Entrance Test Notification 2019 for admission into 2 year B.Ed (Distance Mode) for the academic year 2018-2019. Osmania University, Directorate of Admissions, invited applications through online mode from the eligible in-service teachers for admission into 2 year B.Ed course through Distance Education Centre of Osmania University. ఉస్మానియా యూనివర్సిటీ (ఓయూ) దూరవిద్య బీఈడీ ప్రవేశ పరీక్ష ఈ నెల April 21న (ఆదివారం) నిర్వహించనున్నట్లు డైరెక్టర్ వెల్లడించారు. మధ్యాహ్నం 2 గంటల నుంచి సాయంత్రం 4 గంటల వరకు ఓయూ క్యాంపస్లోని దూరవిద్య కేంద్రంలో ప్రవేశ పరీక్ష జరుగు తుందన్నారు. పరీక్షకు వారం రోజుల ముందు నుంచి హాల్ టికెట్లు జారీ చేయనున్నట్లు చెప్పారు. ఆబ్జెక్టివ్ టైపులో మాన్యువల్గా పరీక్ష ఉంటుందని, 100 ప్రశ్నలకు వంద మార్కులు ఉంటాయని పేర్కొన్నారు. తొలి సారి దూర విద్యలో ప్రవేశ పెట్టిన బీఈడీ కోర్సులో 500 సీట్లు ఉన్నాయని, 2 వేల మంది అభ్యర్థులు ప్రవేశ పరీక్షకు దరఖాస్తు చేసుకున్నారని తెలిపారు. Regular teachers with a Bachelor's Degree serving in a recognized Primary/ Elementary / Secondary Schools located in OU local area and having at least 2 years experience of School teaching are eligible to apply. The admissions shall be made in the order of merit on the basis of the rank obtained in the B.Ed. (Distance Mode) Entrance Test. OU Distance B.Ed Entrance Exam Pattern 2019: The common entrance test will be of objective type with 100 multiple choice questions and of 2 hours duration. 1. Mathematics Methodology : Candidate with B.A./B.Sc. with Mathematics as one of the group subjects or B.C.A. candidates with Mathematics at Intermediate level as a group subject. 2. Physical Sciences Methodology: Candidates with B.Sc. who have studied Physics and Chemistry or allied materials sciences under Part - II group subjects or B.C.A. candidates with Physical Sciences (Physics and Chemistry) at Intermediate level as group subject. 3. Biological Sciences Methodology: Candidates with B.Sc./B.Sc. (Home Science) who have studied Botany and Zoology or allied Life Sciences under Part – II group subjects or B.C.A. candidates with Biological Sciences at Intermediate level as group subject. 4. Social Studies Methodology: All candidates with B.A./B.Com./B.B.M. and B.C.A. candidates with Social Sciences at Intermediate level as group subject. B.Ed. (Distance Mode) course fee is Rs. 20,000/- for all the candidates including BC/SC/ST Candidates. How to Download OU Distance B.Ed Entrance Test Hall tickets? The OU Distance B.Ed Entrance test will be conducted tentatively in April 2nd week, 2019. 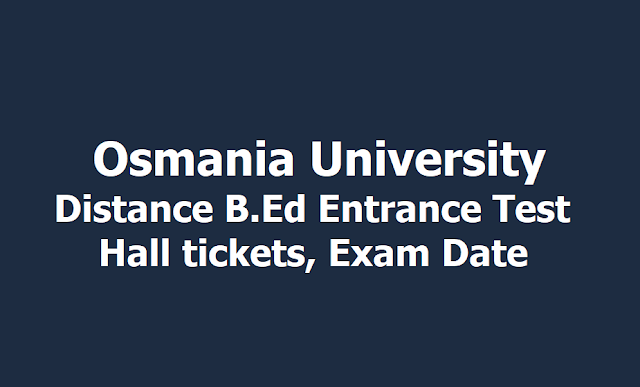 The venue, time and Hall Ticket details will be made available in OU website one week before the date of entrance test. Venue of the Entrance Test : Prof .G. Ram Reddy Centre for Distance Education Osmania University Campus , Hyderabad- 500007. (T.S). దూరవిద్యా విధానంలో 2013-14 విద్యా సంవత్సరంలో ఓయూ బీఈడీ కోర్సులో ప్రవేశాలకు దరఖాస్తులను ఆహ్వానిస్తోంది. గుర్తింపు పొందిన పాఠశాలల్లో రెండు సంవత్సరాలపాటు టీచర్‌గా పనిచేసిన వారు ఈ కోర్సులో ప్రవేశానికి అర్హులని ఓయూ పీజీ ప్రవేశాల డెరైక్టర్ ప్రొఫెసర్ శివరాజ్ తెలిపారు. జనవరి 10లోగా దరఖాస్తు చేసుకోవాలి. ప్రవేశ పరీక్ష ఫిబ్రవరి 2న నిర్వహిస్తారు. వివరాలకు 9440567567 నంబర్‌లో సంప్రదించాలి.